The NTI SERIMUX-CS-8 is a 8-port console serial port switch, which gives IT managers the ability to cost effectively manage serial devices, including servers, switches, routers, and telecom gear. The switch can be controlled via an ASCII terminal with menu-driven integrated software, the front panel keypad, or optional Ethernet interface. -No inadvertent "break" signals are generated to cause unintentional rebooting of SUN computers. High quality, rugged steel construction with durable powder coat finish. 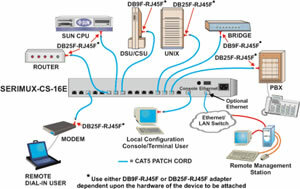 Connects to console serial ports using standard CAT5/5e/6 cables and cable adapters. -Maximum cable length is 100 feet. -All configuration parameters are stored in non-volatile EEPROM. Flow Control Hardware (RTS/CTS), Software (XON, XOFF), both or none.